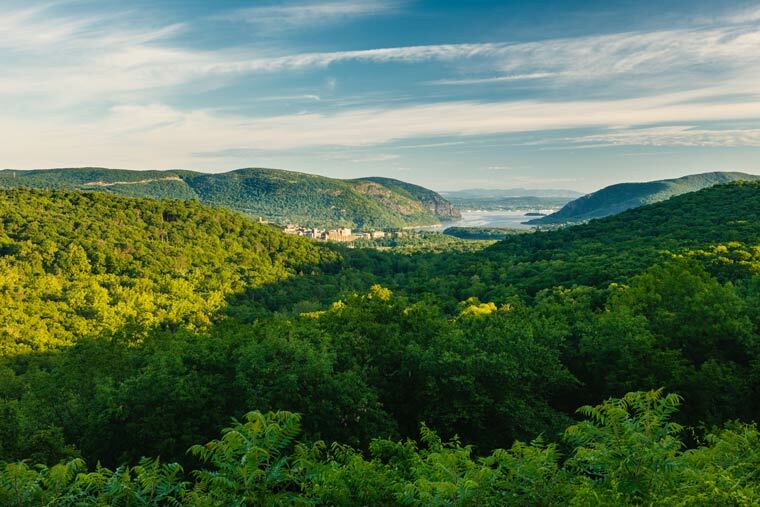 In December 2012, Scenic Hudson protected 121 acres that will create link between two previously unconnected parts of Hudson Highlands State Park. The newly protected property features magnificent Hudson Highlands views. Robert Rodriguez, Jr.
Our acquisition of a conservation easement ensures the permanent protection of the last large family-owned portion of a vast estate created by William H. Osborn in the mid–19th century. (Much of the remaining acreage was donated or sold by family members to New York State for creation of the Osborn Preserve within Hudson Highlands State Park.) In addition to affording magnificent views, the land figures prominently in world-class vistas enjoyed from many popular public viewpoints throughout the Hudson Highlands. Scenic Hudson also acquired an easement to create a public trail across a portion of the primarily forested property that will link two previously unconnected parts of Hudson Highlands State Park, significantly enhancing opportunities for hiking, cross-country skiing, snowshoeing and wildlife watching. By increasing the size of contiguous landscape preserved, the transaction further safeguards the interconnected habitat networks on which many species depend, helping to sustain the Highlands’ astonishing biological diversity.